GABION SUPPLY is one of the few AMERICAN owned and managed suppliers of pre-assembled Gabion Baskets and Mattresses. Please note that most gabions on the internet are made in China, India, Mexico, Europe and Australia. STANDARD GAUGE GALVANIZED GABIONS SHIP IN A COUPLE OF DAYS! Note: Gabions may be field cut to fit curves, culverts, or angles. The cost of gabions and stone fill is nominal; unskilled laborers can be used in construction; the high cost of underwater excavations, driving piling and underground drainage systems is avoided. Gabions are virtually maintenance free and construction speed is hastened because no forms, reinforcements, setting or curing time are necessary. GABIONS incorporate two important features. First, diaphragms are used to divide the gabions into one cubic yard long cells and are designed to eliminate movement of the rock fill while reinforcing the structure. Second, the wire is hot dip galvanized. Gabion units are also supplied in plain steel, PVC coated steel, aluminum and stainless steel, Galvanized wire coated with durable, fusion-bonded PVC (polyvinyl chloride) for use in sea works, in water polluted by sewage or chemicals or wherever abrasion is prevalent. RETAINING WALLS. Gabion walls can be built with speed and economy in all circumstances and are particularly suitable for landslide control in mountainous terrain and in areas with persistently unstable conditions. Where ground is liable to subside, the ability of gabions to deform makes them preferable to a concrete wall which would crack and collapse. MATERIAL. a. General: Gabions shall be made of pre-galvanized welded steel wire mesh of a nominal size of 3" x 3(7.5 cm x 7.5 cm). b. Dimensions: Gabions shall be supplied in various lengths and heights. Dimensions for heights, lengths, and widths are subject to a tolerance of “5% of manufacturer's stated sizes. FABRICATION. Gabions shall be fabricated in such a manner that the base, sides, lids, ends, and diaphragms can be assembled at the construction site into a rectangular unit of the specified size. Where the length of the gabion exceeds its width, the gabion shall be divided by diaphragms into cells of equal length. 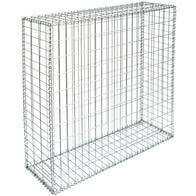 The wire mesh shall be made of galvanized steel wire having a diameter of 0.120(3.0 mm) or 0.106(2.7 mm). According to ASTM A-974-97, all wire used in the fabrication of the gabion and in the wiring operations shall conform to US federal specifications QQ-W-461H and possess a soft tensile strength with a class 3 finish 5 zinc coating in accordance with ASTM A-641. 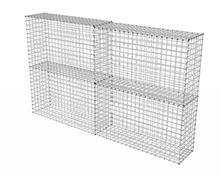 Preformed steel wire spiral binders with a 3" pitch are used to assemble and interconnect empty gabions and shall meet the same specifications as the wire used in the mesh. After assembly, the individual gabion units are interconnected to each other as per manufacturer's instructions and then filled with clean, hard stone from 4-8' in diameter. The lids are then closed and joined to the top edges of the individual gabions and diaphragms. Ring fasteners and twist-ties may be used in lieu of lacing wire for forming individual baskets and joining empty baskets together. A twist tie shall be provided at intervals of about 6". The connection shall be accomplished by turning the twist tie through 1-1/2 turns. Ring fasteners, twist ties and lacing wire can be used in lieu of spiral binders. RESISTANCE OF THE COATING. The protective coating must be resistant to the destructive effects of immersion in acidic, salt, or polluted water, exposure to ultraviolet light and abrasion and shall retain these characteristics after a period of not less than 3,000 hours under tests in accordance with ASTM G-23. MATERIAL. Gabion mattresses shall be made of welded steel wire mesh of a nominal size of 1-1/2" x 3(3.8 cm x 7.5 cm). Gabion mattress units shall be supplied in various lengths. The thickness shall be 6", 9", 12" or 18". The horizontal width shall be 6'. All dimensions are subject to a tolerance of ± 5% of manufacturer's stated sizes. FABRICATION. Gabion mattress units shall be fabricated in such a manner that the base, sides, lids, ends, and diaphragms can be assembled at the construction site into a rectangular unit of the specified size. The mattress unit length shall be subdivided into 3' compartments by the insertion of diaphragms made of the same mesh as the rest of the mattress. 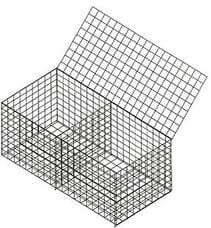 The wire incorporated in the mesh constituting the body of the mattress shall be made of galvanized steel wire having a diameter of 0.087" (2.2 mm). 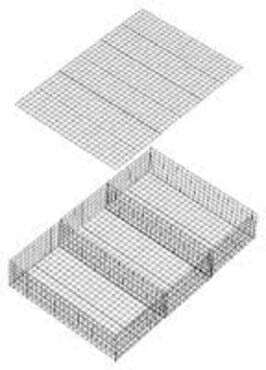 Preformed steel wire spiral binders with a 3" pitch are used to assemble and interconnect empty gabion mattresses and shall meet the same specifications as the wire used in the mesh. All wire used in the fabrication of gabion mattresses and in the wiring operations shall conform to ASTM A-974-97 and US federal specifications QQ-W-461H and possess a soft tensile strength with a class 3 finish 5 zinc coating in accordance with ASTM A-641.